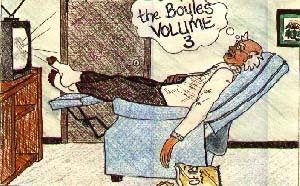 Buy this Audio Cassette with The Boyles - Volume 3 Cassette ~ Adam Kontras today! -Lester tells the whole family about his big moment back in the 30’s. -Johnny ruins Lesters' 75th birthday by having Adam come down from Columbus. -Johnny breaks his leg and Lester proceeds to laugh all day. -Lester and Johnny pull a practical joke on the whole family. -We find out the truth about the familys history. -Lester causes a stir over Johnny having to go back to school in August. -The talkative Suzy Snarfwagon is introduced to the family. 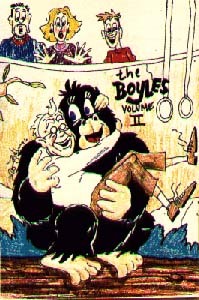 The Boyles - Volume 2 is where the family changed from random voices to a radio phenomenon. Each of the ten episodes is grander than the next with fully developed plots and wonderful scenerios. From Lester's childhood in the 30's to mammoth practical jokes to the infamous trip to the zoo - this is where the family found their niche in The Late Show and became a staple until the final show. Highly recommended.